SanDisk has laid the groundwork to launch a large-scale assault on the portable MP3 player market in 2007. Speaking at CES in Las Vegas , the company announced two fascinating new Sansa products for launch in 2007 which will surely have Creative and Microsoft quaking in their boots. Leading the way is the 'Sansa View,' a widescreen portable media player with an impressive-sounding 4-inch TFT screen for watching movies and TV on the go. 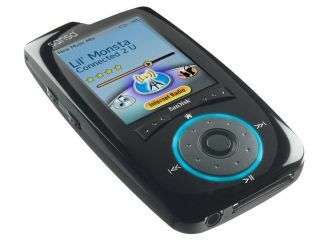 Also coming this year from the SanDisk camp is a new Wi-Fi-equipped 'Sansa Connect' MP3 player. Predominantly a flash memory manufacturer, SanDisk has had huge success with the launch of its Sansa range of MP3 players, which have fast become the number two selling players in America and Europe, overtaking Creative in the process. But the company has so far been unable to make up any real ground on the runaway market-leading Apple iPod. Overtaking Apple is clearly not an option at the moment, as the iPod is so far ahead it's ridiculous. And so SanDisk looks like it is instead seeking to consolidate its position as number two in the market. The two new Sansa products are going to be directly competing with similar products from Creative and Microsoft. The Sansa View will be up against the Creative Vision W in the portable video market, and the Wi-Fi Sansa will obviously be in direct competition with Microsoft's Wi-Fi-enabled Zune. SanDisk's secret weapon of course is that it uses its own flash memory instead of more bulky, expensive hard disks like the ones inside the Vision W and the Zune. So both these new Sansas are likely to be aggressively priced, which spells extremely bad news for the already flagging Microsoft Zune, and Creative will hardly be jumping for joy either. The Sansa Connect boasts internet capabilities designed to keep users connected to a wide range of new music via subscription services and streaming Internet radio with no PC required. It will also contain community features for recommending music and photos with the simple click of a button and a 'live' Wi-Fi connection. These wireless features are far more advanced than those utilised by the Microsoft Zune, and it's also interesting to see that SanDisk has beaten Apple to market with its 'Zune killer.' Many may feel of course that in the case of the Zune, there's no killing required.